“You can’t inflict this on your colleagues any more. Why should we treat our children’s health as a lower priority?” he said. who recently took over as head of the college, said children should not have to breathe in their parents’ cigarette smoke. “Cars are small tin boxes, with not much air in them. “Smoking just one cigarette, even with the window open, creates a greater concentration of second-hand smoke than a whole evening’s smoking in a pub or a bar. But Neil Rafferty, Scottish spokesman for Forest, the pro-smokers’ rights group, said: “We don’t think that children should be exposed to smoke in a car but a ban would be a waste of police and court time. “Would it be OK if you opened the sunroof or a window while smoking? It’s an impractical suggestion. 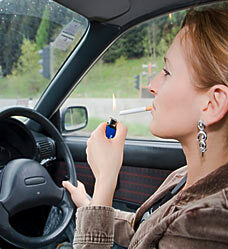 Drivers who smoke at the wheel could face prosecution under changes to the Highway Code. Lighting-up at the wheel has been added to the list of “distractions” which police and lawyers can cite in court when seeking a conviction for a traffic offence. It joins eating and drinking, “inserting a cassette or CD or tuning a radio”, “arguing with your passengers or other road users”, trying to read maps, and – even playing loud music – most, if not all, of which have featured in successful prosecutions. High-profile cases have involved motorists eating apples, Kit-Kats and sausage rolls. Up to one in four UK adults smoke, which could mean more than eight million of the nation’s 33 million motorists are at risk. Brian James, road traffic chairman of the Magistrates Association, said that although the code carries no legal force, failure to observe its advice could be used as evidence that an offence had been committed. The new Highway Code, the first for eight years, has increased in size by about 50 per cent and contains 29 more rules. There is also a new section for novice drivers. Andrew Howard, the AA’s head of road safety, said last night: “The Highway Code is the definitive guide to safe and lawful road use. “It has grown since 1931 from 18 pages to 135, reflecting the complexities of modern motoring. “A major change is the inclusion of smoking at the wheel as behaviour that police may interpret as a distraction and failure to be in proper control of the vehicle. A recent report by academics at Brunel University warned that car crashes could rise as the ban on smoking in public places leads more people to take a drag at the wheel. It said smokers drive 23 per cent faster and are more inconsistent than non-smokers. The report for insurance company Privilege reinforced growing calls for smoking while driving top be made a criminal offence like using a mobile phone, which now attracts three penalty points and a £60 fine. Supporters say holding a cigarette is equally dangerous. – Never show off or try to compete with other drivers, particularly if they are driving badly. • Only one in 20 accidents are caused by drivers breaking the speed limit, Government figures showed yesterday. A failure to look properly at the road and traffic is a bigger reason. It was a contributory factor in more than a third of accidents and one in five deaths last year, according to the Transport Department. What are these changes to the Highway Code? In the UK and elsewhere work vehicles are classified as workplaces – why does Hong Kong not follow this sensible law ? (c) any person on a vehicle who is responsible for order or safety on it. (b) in the course of paid or voluntary work by more than one person (even if those persons use the vehicle at different times, or only intermittently). (2) A vehicle or part of a vehicle is enclosed for the purposes of paragraph (1) where it is enclosed wholly or partly by a roof and by any door or window that may be opened. (3) Except where paragraph (4) applies, “roof” in paragraph (2) includes any fixed or moveable structure or device which is capable of covering all or part of the vehicle, including any canvas, fabric or other covering. (4) In relation to a vehicle that is engaged in conveying persons, “roof” does not include any fixed or moveable structure or device which is completely stowed away so that it does not cover all or any part of the vehicle. (b) has a right to use it which is not restricted to a particular journey. (b) ships or hovercraft in respect of which regulations could be made under section 85 of the Merchant Shipping Act 1995(6) (safety and health on ships), including that section as applied by any Order in Council under section 1(1)(h) of the Hovercraft Act 1968(7) or to persons on any such ships or hovercraft. Late last week, just after the Senate overwhelmingly approved a bill to give the Food and Drug Administration regulatory authority over the deadliest legal product known to man — cigarettes — Steven C. Parrish sent an e-mail message to David A. Kessler. Yes, I know: it sounds like a perfectly ordinary exchange after the passage of a piece of legislation. I’m sure hundreds of people who were part of the effort to regulate tobacco over the years sent one another similar messages. But what made this exchange a touch extraordinary was the particular people involved. David Kessler is a former commissioner of the F.D.A. and a fierce, lifelong enemy of tobacco companies. (He is now a professor at the University of California San Francisco School of Medicine.) Steve Parrish is a former tobacco executive who spent years fighting Dr. Kessler until he had a change of heart, and then helped persuade his company, Philip Morris, to support F.D.A. regulation. (The name was changed to Altria in 2003.) Since 2000, in large part because of Mr. Parrish, Philip Morris has backed — and lobbied for — tobacco regulation. This coming week, perhaps as early as Monday, President Obama will sign the bill into law, bringing tobacco products under federal control for the first time. Given the speed with which the bill flew through Congress this time around — the Senate vote was 79 to 17, while the House vote was 307 to 97 — the legislation seemed to have an air of inevitability about it. But as Matthew L. Myers, the head of the Campaign for Tobacco-Free Kids, told me this week, that inevitability “was a long time coming.” Over the course of the last 15 years, an idea that was once viewed as highly controversial, even a little outlandish — and that struggled to get a toehold in Congress — gradually came to be viewed as conventional wisdom. Although the F.D.A. bill still has its critics, who fear that the agency will be overwhelmed by the tobacco companies, and that it doesn’t go far enough to eradicate smoking, they are in the small minority. Most people now view the regulation of cigarettes as a demonstrably good thing. And it is. Under the new law, the F.D.A. will be able to mandate a reduction in nicotine levels, for instance. New products that claim to reduce the harm from cigarettes will have to go through a rigorous scientific review process. The agency will usher in bigger, more graphic warning labels and tougher advertising restrictions. Besides, in a country that regulates everything from lipstick to beer, how can it possibly make sense to take a hands-off attitude with a product that kills some 400,000 people a year and to which a fifth of the population is addicted? This year, over 1,000 public health groups backed the bill. That is a far greater consensus than existed even a few years ago. And while a great deal of credit goes to Representative Henry A. Waxman, Democrat of California, and Senator Edward M. Kennedy, Democrat of Massachusetts — both of whom devoted years to getting the legislation passed — there were also these three others, strange bedfellows for sure, who were critical in making cigarette regulation come to pass: Dr. Kessler, Mr. Parrish and Mr. Myers. Take a bow, fellas. Our story begins in the mid-1990s when the country was in the midst of the tobacco wars. State attorneys general were suing Big Tobacco for billions of dollars. Documents were being released almost daily that exhumed the industry’s reprehensible behavior. Secret negotiations led to a 1997 settlement with the Clinton administration — a deal that would have included, for the first time, federal regulation of tobacco products. But the proposed settlement derailed once it went to Congress because legislators refused to give tobacco companies the litigation relief that had been part of the original deal. As it turns out, Dr. Kessler was wrong to interpret the law that way. The tobacco companies fought his effort all the way to the Supreme Court, which ruled by a 5-to-4 vote in 2000 that only Congress could give the agency authority over cigarettes. Despite the loss — and despite the fact that Dr. Kessler was gone from the agency by early 1997 — the idea of regulating tobacco was now on the table. And it wasn’t about to go away. But even before the Supreme Court made its ruling, Mr. Parrish had come to the conclusion that the tobacco industry needed to be regulated, something he began to talk to Dr. Kessler about even before he went public. There has always been a great deal of skepticism about Philip Morris’ about-face — critics fear that its overwhelming market share could well be locked in by new marketing and advertising restrictions, for instance — but Mr. Parrish has always insisted that market share wasn’t what motivated him. Rather, he said, it was his strong belief that federal regulation “could completely transform the industry.” In particular, Mr. Parrish believed that F.D.A. regulation could help push the industry to innovate — coming up with cigarettes, or cigarettelike products, that were less lethal. Indeed, Altria has built a $350 million research facility aimed at coming up with less harmful products. And last September, it bought UST, a leading smokeless tobacco company, for $10.4 billion — and smokeless tobacco is far less harmful than cigarettes. But because the tobacco industry has zero credibility, only the F.D.A. would have the moral authority to make health claims, based on real science, about smokeless products versus cigarettes. Whatever its motives, Philip Morris threw its weight behind the legislation. Though it failed to pass twice in the last half-dozen years, the company’s support made a huge difference in bringing around Republicans who saw that tobacco companies were no longer unanimous in their resistance to federal regulation. And then there was Mr. Myers. Back in 1997, he had been party to the secret negotiations between the tobacco companies and the Clinton administration. When word of his involvement leaked out, there was a furor in the public health community — because it was part of the public health dogma that its side should never, ever consort with a tobacco company. That dogma never really went away. But Mr. Myers is both a realist and a pragmatist. Ever since that proposed settlement collapsed, his chief legislative goal has been to get the tobacco companies regulated by the F.D.A. If Altria wanted to support the legislation, that could only help. For sure, it meant that Altria would have a seat at the table as the bill was being hashed out. But most of what Altria wanted — an insistence, for example, that the F.D.A. not be able to outlaw cigarettes entirely — was likely to have been in there in any case. Any bill that didn’t contain such a provision would be open to accusations that it would lead to a new era of prohibition. Even Senator Kennedy and Representative Waxman wanted that in the bill. The hard part was overcoming suspicions elsewhere in the public health community that the whole thing was some kind of deceptive Philip Morris plot. One reason the bill died in 2004 was the huge division in the public health community over Philip Morris’s support. Even Dr. Kessler worried at the time that if Philip Morris was in favor of the bill, then there must be something he and the rest of the public health community weren’t seeing. So for years, Mr. Myers had to walk a delicate line, trashing Philip Morris publicly while quietly taking advantage of Mr. Parrish’s support and connections on Capitol Hill to move the bill forward — without ever acknowledging that help. And all the while he had to persuade the rest of the public health community of something that should have been obvious: if it was a good bill, why should they be concerned that Philip Morris supported it? All that mattered was the result: cigarettes would be regulated. A year ago March, Mr. Parrish left Altria after the company spun off Philip Morris International. It moved its headquarters to Richmond, where the company manufactures cigarettes. Truth be told, there are plenty of executives in Richmond, old-line tobacco men, who wish Mr. Parrish had never had his conversion, and that the company had never backed tobacco regulation. Perhaps that explains why this year, with Mr. Parrish no longer on the scene, Altria executives said almost nothing in public in support of the bill, other than issuing a dutiful press release or two. Periodically there were rumors that the company was planning to turn its back on the bill. But that never happened, and I have it on good authority that the possibility was never discussed in Richmond. Because of Mr. Parrish’s efforts in previous years, there was simply no way Altria could come out against the bill. When the signing ceremony takes place next week, Mr. Kessler and Mr. Myers will both be in attendance, where they will no doubt receive well-deserved congratulations. As a former tobacco executive, Mr. Parrish has not been invited. So his role will be underplayed, just as it was when he was working on behalf of the bill. He shrugged when I asked him about this slight. “The name of the game was getting the bill, not getting credit,” he said. He didn’t sound the least bit disappointed.